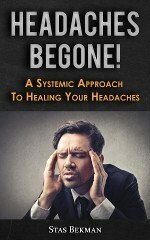 Sometime it may be possible for you to do more than rearrange the things in your room. You may have the opportunity to buy some new furniture and rugs, to have the walls refinished and to buy new curtains. Let us "make believe" that you can refurnish your room just as you would like to have it. You will enjoy pretending that you are furnishing your ideal room and perhaps sometime your "make-believe" room will come true. There is much for you to learn about furniture, rugs, walls, curtains and bedding. You must know how to make a room attractive, comfortable and convenient to live in and how to furnish it as economically as possible. This chapter discusses furniture, walls and lighting. In the next chapter you will learn about rugs, curtains and bedding. While you are working on this project you should save pictures, samples of materials and price lists. You will be able to get these things from advertisements in magazines and newspapers, stores and catalogs. It is often possible to secure pictures and other illustrative material by writing to firms that advertise free booklets and samples. When a wise housewife buys a piece of furniture she considers carefully to be sure that she selects the most attractive design that it is possible for her to buy. She knows what points to look for in an attractive piece of furniture and examines each piece for its lines, proportion, wood, color and finish. Good Lines in Furniture. - Most furniture is rectangular and box-like in its structure so that the structural lines are straight. When curved lines are added to increase the attractiveness of the design, the curves should not interfere with the rectangular structure. If the curves are too pronounced the furniture is apt to look weak. Examine the table legs in Fig. 133 and try to answer these questions. 1. Which is the strongest and most graceful looking curve for a table leg? 2. Which of the straight table legs do you consider most graceful? Why? 3. Which of the straight legs do you consider most uninteresting? 4. What is wrong with table leg No. 1 ? With No. 2 ? 5. Which table leg do you like best? 1. Which designs have good, strong curves that you think combine well with rectangular construction? 2. Which bed lacks unity of line in the shape of the head and the shape of the foot? 3. 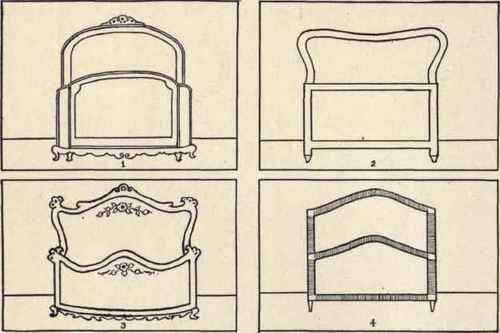 Which bed has curves which make the design seem restless? 4. Do you think a bed should look solid and comfortable to sleep in? Which bed looks most solid and comfortable to you? A Problem to Do. - Make a sketch showing the shape of the top of your bed. If you were a furniture designer do you think you could improve upon it? If so, make another sketch showing how you would do it. Good Proportion in Design. - Proportion or good spacing is an art principle that you study about in relation to furniture as well as to dress. Perhaps you have already learned about it in your art class. Good proportion in furniture means that the different parts of the piece of furniture are spaced so that they are interesting. When the spaces are exactly alike the effect is monotonous and ordinary looking. Which dresser in Fig. 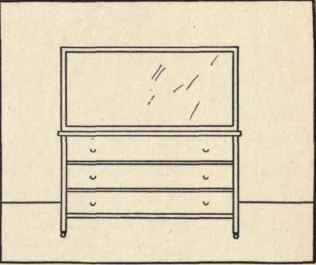 135 is unattractive because the space for the mirror and for the bottom part of the dresser are exactly alike? 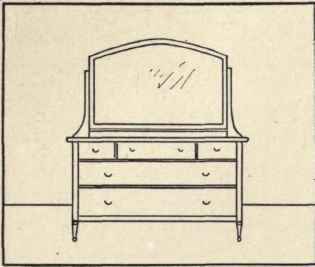 How is this proportion varied in the other dresser? Notice the way the drawers are spaced in each dresser and decide which you think is better looking. Problems to Do. - 1. Find a picture of a dresser that you think is well proportioned and be prepared to explain to the class why you think so. 2. Criticize some piece of furniture in your classroom for its proportion. Kinds of Wood Used in Furniture. - The kind of wood used contributes much to the beauty and attractiveness of a piece of furniture. The woods which probably are best known and are most widely advertised for furniture are oak, mahogany and walnut. Each of these woods has its particular characteristics and can be recognized by one who has studied woods. Mahogany is finished with varying shades of red and brown stain and generally shows comparatively little grain in the finished wood. It takes a very smooth and lustrous finish so that it is especially prized for furniture. Very often birch which is a cheaper wood is used to imitate mahogany. Most of the furniture that is advertised and sold as mahogany is really made of birch with a mahogany finish. Ask the manual training teacher or a furniture dealer if he can show you how to distinguish between real mahogany and birch with a mahogany finish. Walnut is also a hard wood and is sometimes difficult to distinguish from mahogany. It is as beautiful as the mahogany, taking the same smooth, lustrous finish. In color it varies from the lighter tones to soft, dark, rich shades of brown. Most furniture that is sold as walnut is really made of gum wood with a walnut finish. You can see, therefore, that it is important to be able to distinguish real and imitation walnut. If possible you should get someone to show you the difference. There is a kind of wood called Circassian walnut which is not a walnut at all but a kind of ash, having a very prominent grain. Some people do not like this wood for furniture because the very marked swirling lines of the grain in the wood are disturbing.